No, I’m not referring to the famous cowboy series. 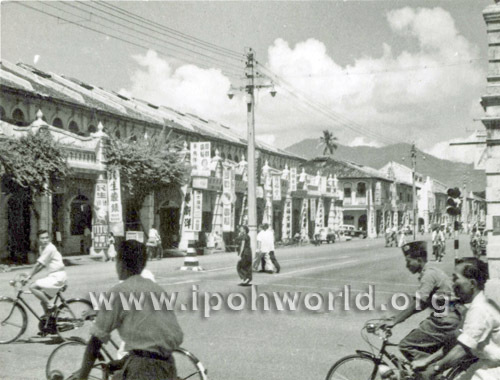 I’m talking about this row of shops along Hugh Low Street. At present, seven of these shops have been painted according to the seven colours of the rainbow. This picture however was taken back in the 1950s. We’re not offering any prizes for guessing, but all the same can you name any/or all of the seven shops in particular? We thank John McAuley for this picture. How nostalgic this scene is? The 7 shops at their height of business. (Sigh) today, those businesses had closed. And the bicycles galore, a common mode of transport of many. Felicia, if i wanted to share a picture with Ipohworld, what would be the email address? I do enjoy Ravi Shankar’s music and that of his daughters. Shankar, of course, influenced composers around the world, among them the American minimalist, Philip Glass: the two of them made an album, Passages, which is still one of my favorites. About Lendo: Thanks for the additional information. I don’t recall ever buying anything there except perhaps on the day the shop opened in the mid-’60s. I wonder when it closed down. Can you estimate?